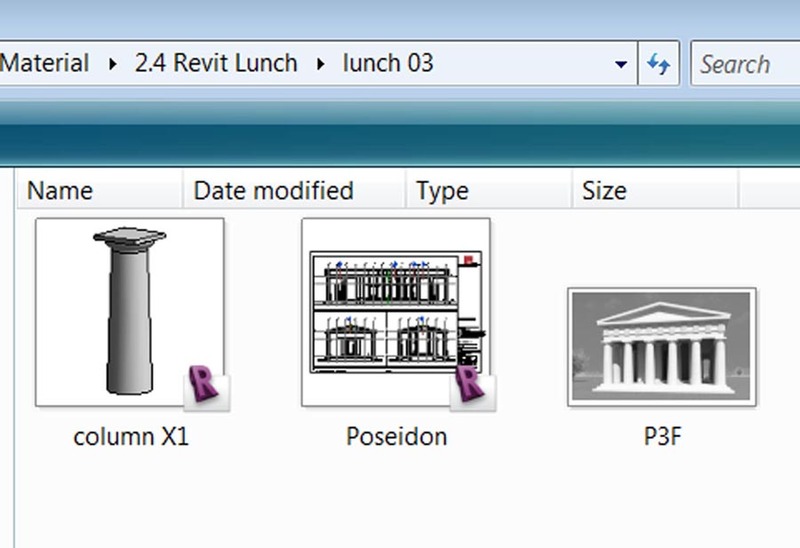 Last post, I mentioned the Revit Lunch: Starter, Main Course, Dessert. The pictures above come from one of my main courses. I was just playing around one weekend, trying to link parameters together so that simple changes in input might generate more complex results. I also wanted to practice using the ability of reference lines to control angular relationships better than reference planes can. I came up with this little radial array of round columns. 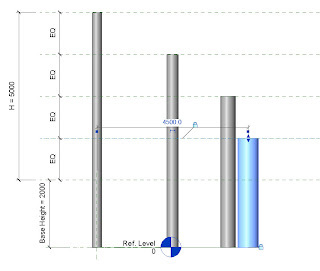 It's set up so that the taller you make the column, the thinner it gets. To further simplify input. 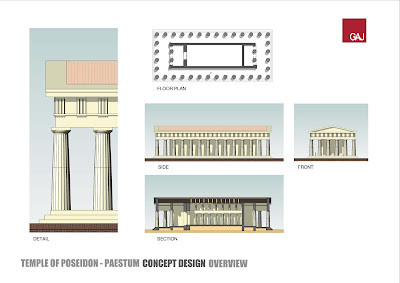 All the columns in an array are linked together to grow progressively taller. 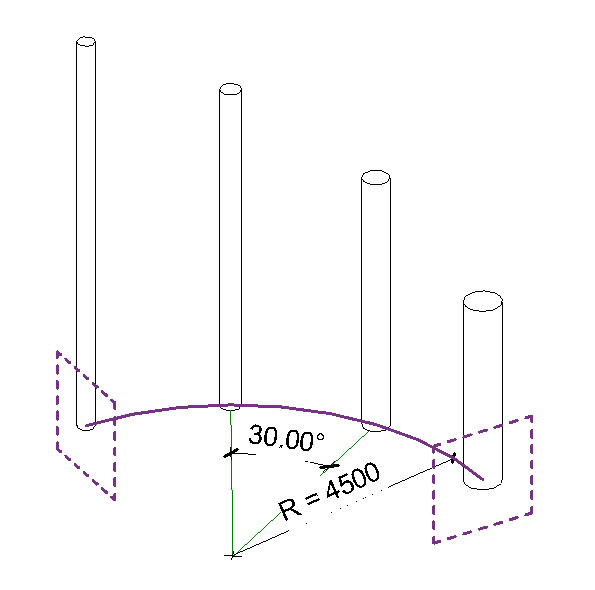 So for each array you only input 2 dimensions, a height & a radius. Three of these were arranged concentrically. 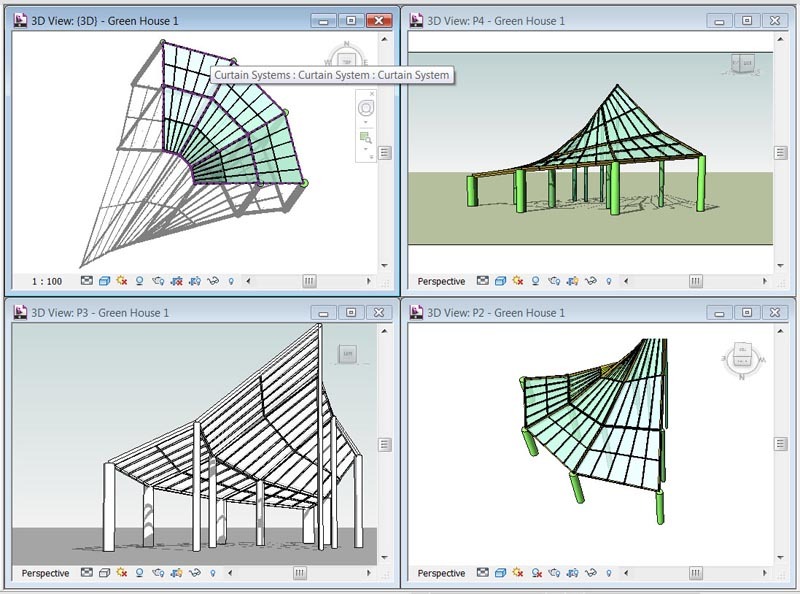 Then I built a conceptual mass surface based on reference lines snapped to the end points of the columns. 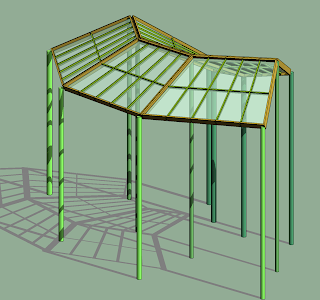 And used curtain system by face to create a canopy. 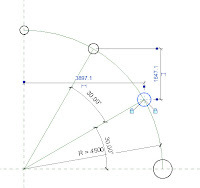 There just 3 heights & 3 radii to play with, so it's quick to make changes that radically alter the form. It can look a bit like Stirling's History Library, all sloping one way. You can make it pitch up to a ridge in the middle, or down into a central valley. Actually, I lied. There are 2 heights in each family: a base height & a variation height. If you make the base small and the variation large then you get a dramatic swoop around the curve. 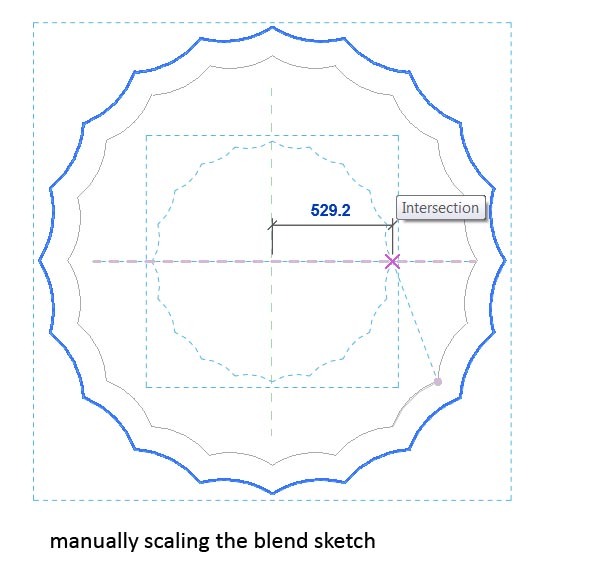 But if the base is big, and the variation small then the effect is much more subtle. 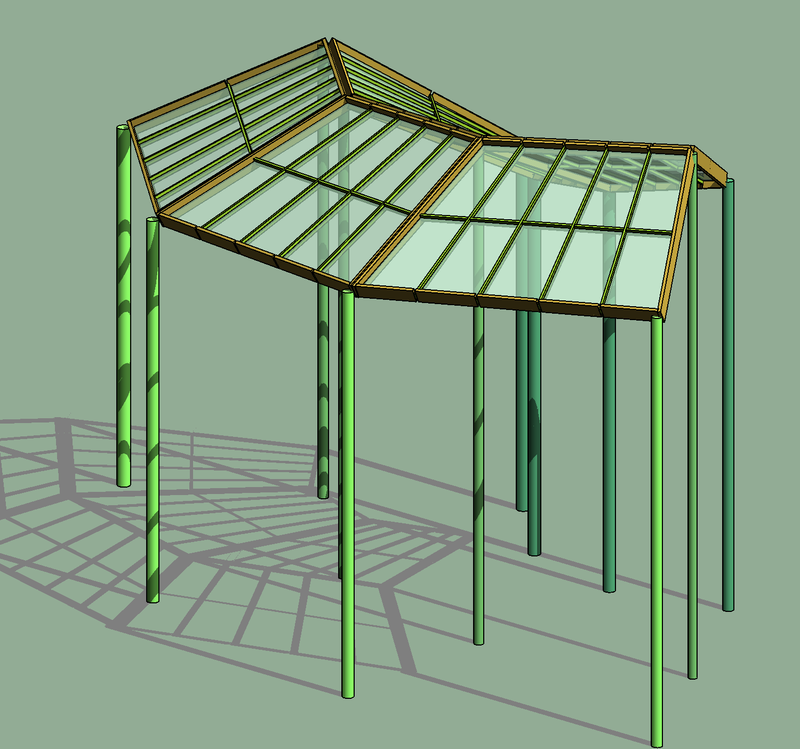 I called it the Green House Gas, because it's a bit like a Greenhouse, and all the materials are green, and I enjoyed making it. 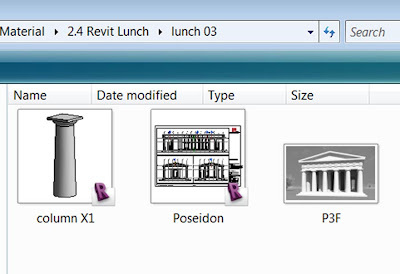 Earlier this year I started a thing called the "Revit Lunch" We have a resource area at GAJ where presentations & design reviews take place, which doubles up as a kind of canteen space. 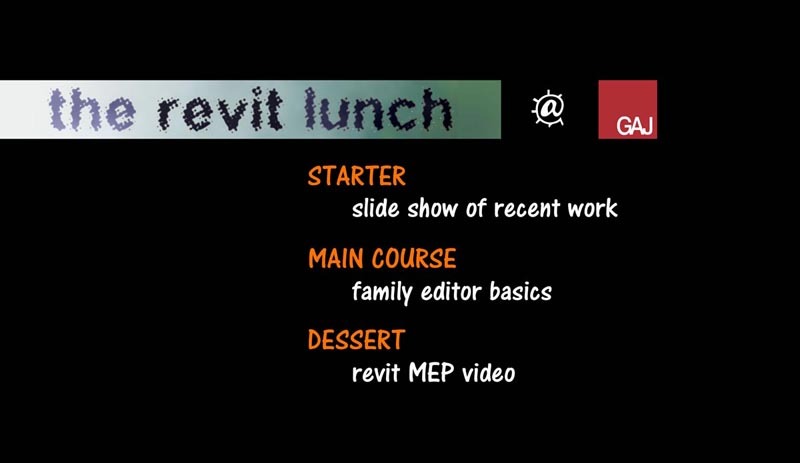 My idea was to give weekly presentations aimed at intermediate level users who want to get deeper into family creation, or conceptual massing, or whatever. I break it down into Starter, Main Course & Dessert. Maybe start with a slide-show loop and finish with a video clip. 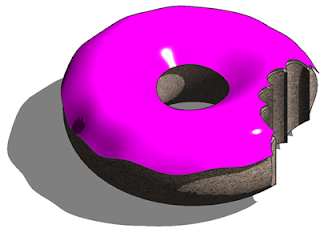 One time we had Zach Kron's icing the donut clip for dessert, which seemed appropriate. 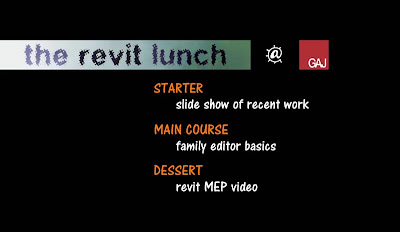 First main course was a gentle introduction to wall-hosted families. 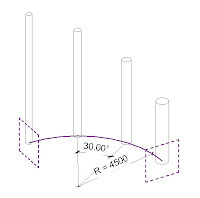 Cut openings versus void extrusions & sweeps. 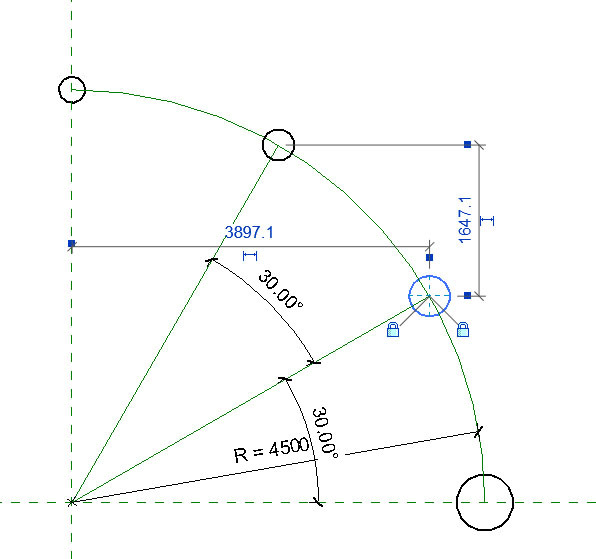 Locking geometry to reference planes. I dropped this image into the server library to remind people what we covered. The weekend before lunch 03 I got inspired to model a Greek temple. 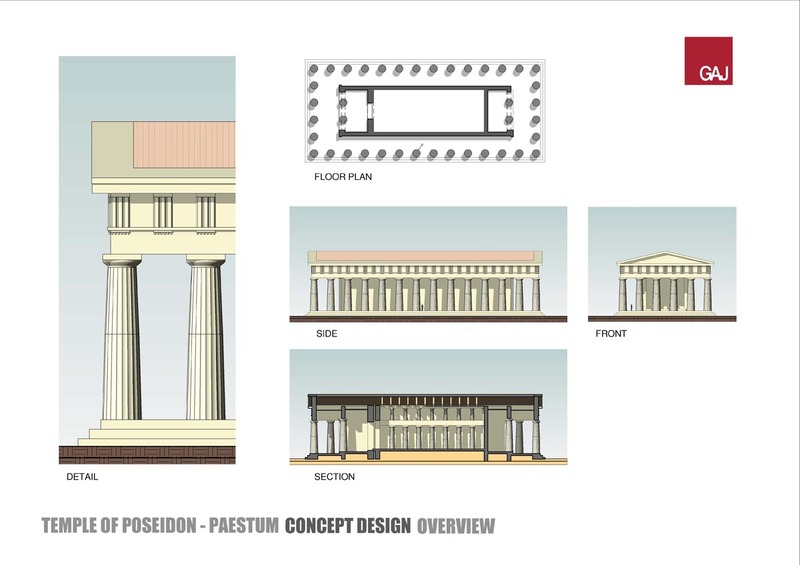 Started out as "how to tackle the fluting on a doric column" Ended up as what used to be called the temple of Poseidon at Paestum, a Greek colony in Southern Italy. I wanted the fluting to be based on a profile that could be scaled parametrically, but couldn't get this to work. 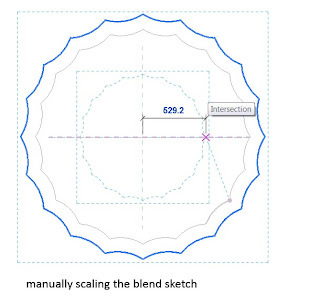 Had to be content with manually scaling the sketches in family editor. 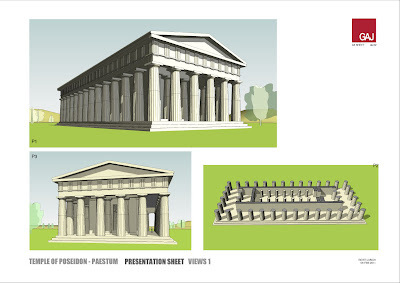 It's a pretty fast way to make doric columns of different sizes & proportions. 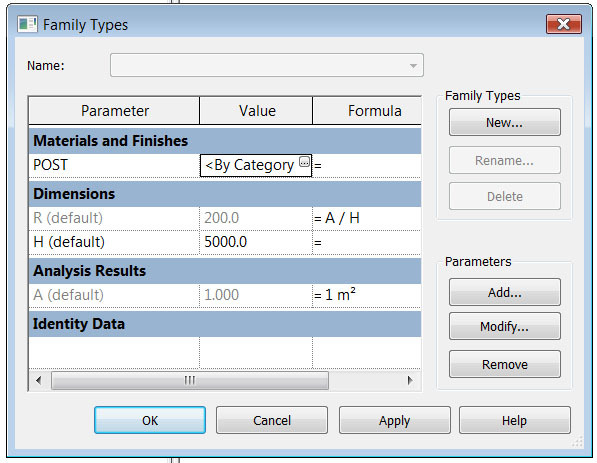 One day I'll have another go at making it all operate from 2 or 3 parameters in the family type dialogue. 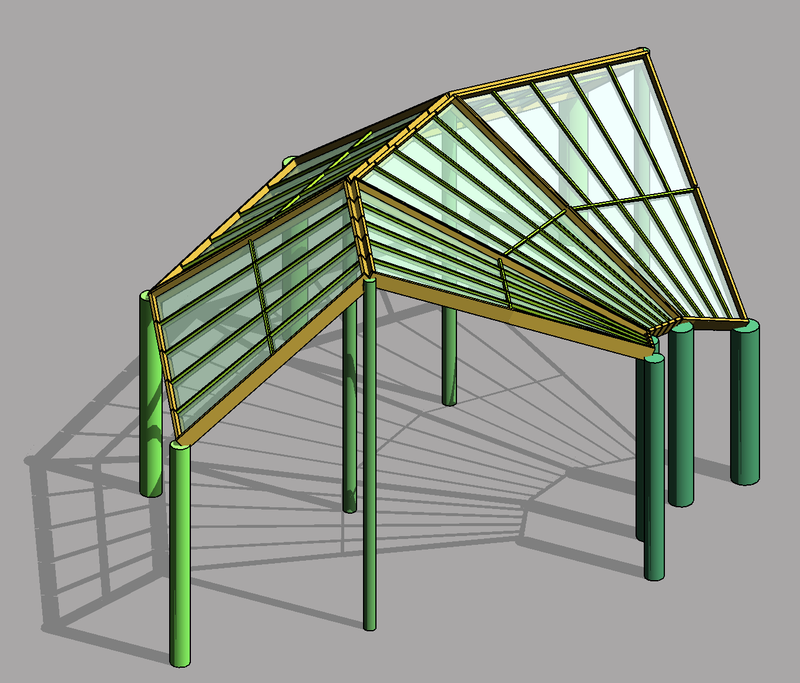 This was just a quick weekend exercise, but it demonstrated to me once more the depth of insight that building a Revit model of something brings. I think it should be a mandatory part of all History of Architecture courses. 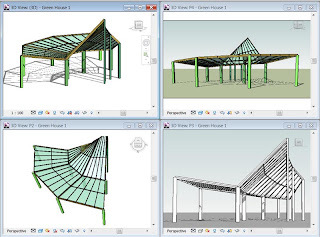 Work in groups, collect lots of reference images for the building, divide up the family creation work, assemble your model. Then each student gets to set up views, renderings, text & analysis on a single A1 sheet to convey the insight they gained into the chosen building. 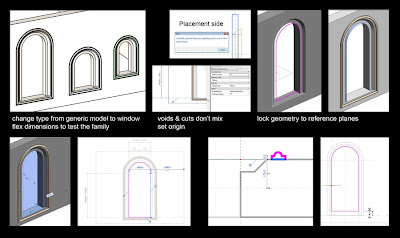 If every school of Architecture around the world was doing this, and they posted all the results on open websites, think what a resource that would become. 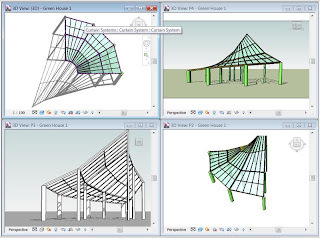 Kind of Great Buildings.com on steroids. 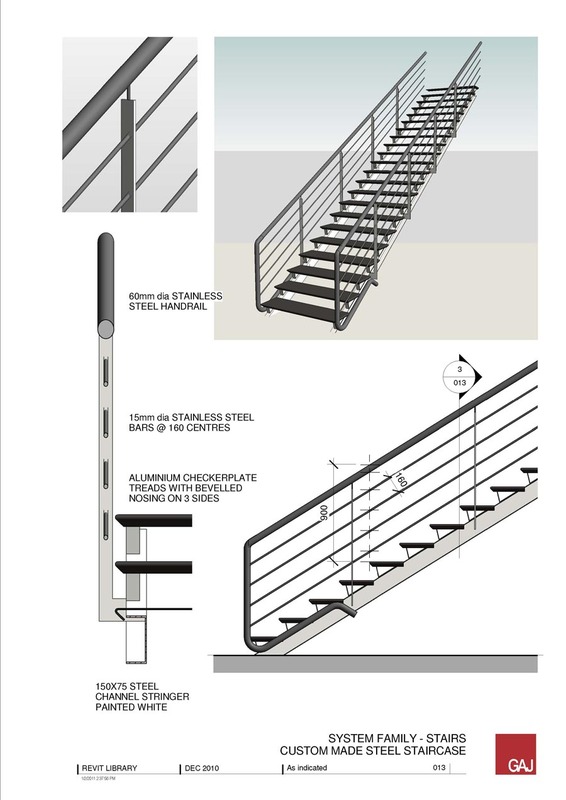 So one of the April fools gags this year was about the Stairs & Railings tools that have once more failed to arrive with the new release of Revit. Everyone moans about Stairs & Railings and they can be a pain, but the more you use the existing tools the more you find you can achieve. Over the christmas break I set myself a couple of staircase challenges. 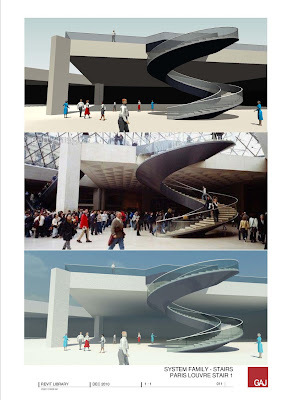 No 1 was the helical stair under the pyramid in the courtyard of the Louvre. Three images above are Realistic, Reference Photo & Rendered. The railings are the key here. The round handrail is easy stuff, The glass is a continuous rail with joints formed by balusters that are just slivers of glass lying in the same plane. 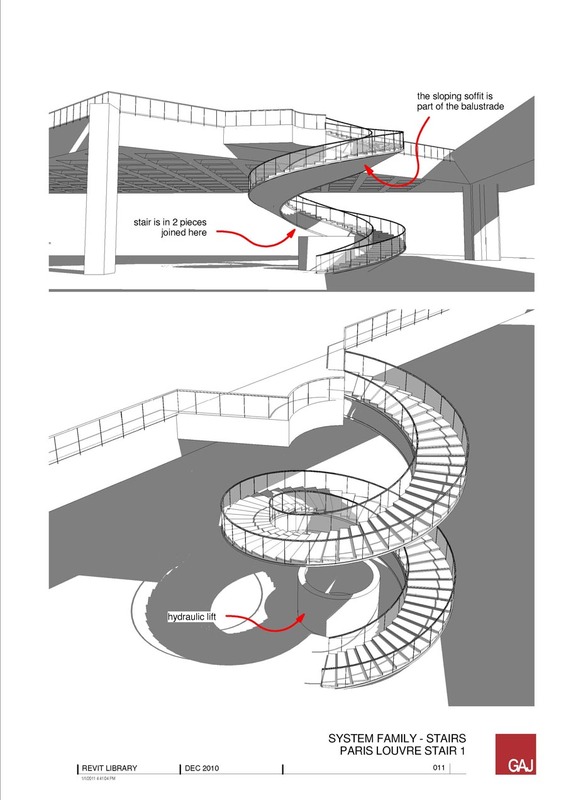 Gives the effect of a series of curved panels with very little effort. 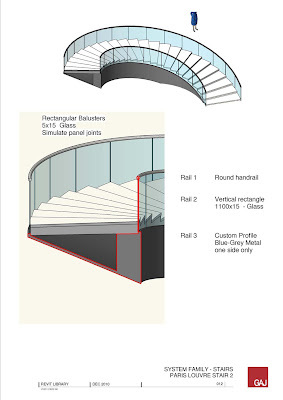 The triangular undercarriage of the stair is also created as a railing with a custom profile. Final sheet is from our office server Revit library. 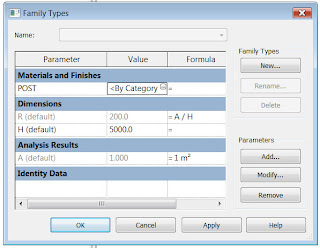 I've created a "collections" folder with a file for each category of families, and I just drop in there whatever I make or find so people can copy/paste whatever they find useful. It's a lot more user-friendly than browsing through folders opening & closing families till you find the one you want. I also means I can set up explanatory sheets like the one above, or maybe a sheet on office standard naming conventions. 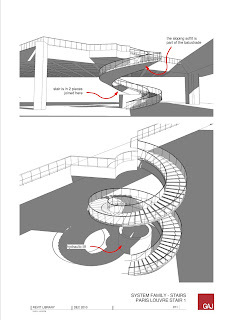 Flushed with success I went on to tackle and open-tread steel staircase which also uses more than one railing. 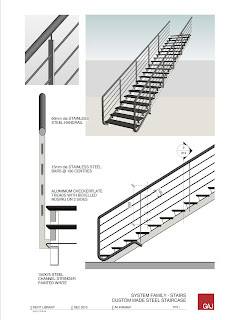 The brackets are balusters in a baluster-per-tread railing which is separate from the "real" railing. 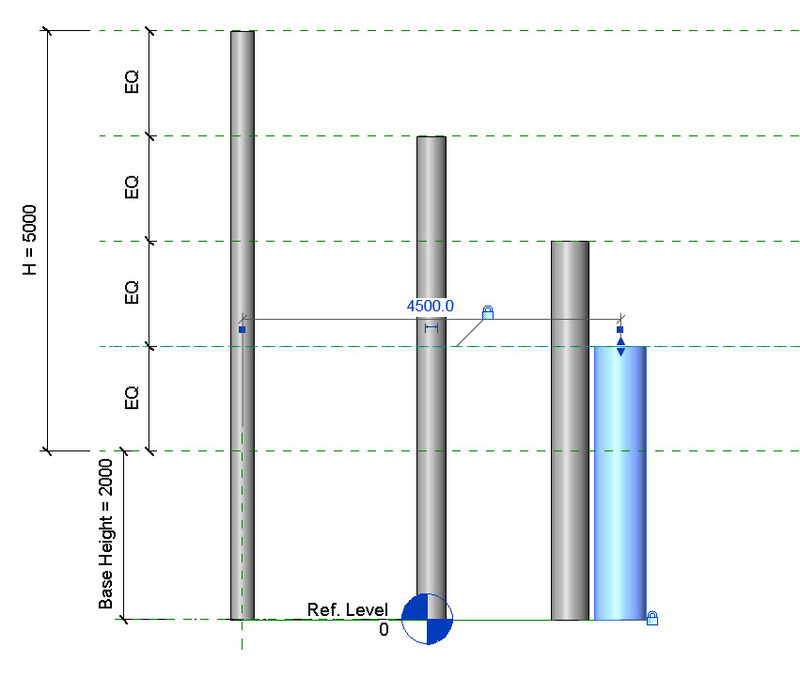 The steel channel stringers are part of this second railing. Used a custom nosing for the open treads and that was it. Will get round to rendering this one day.